Several independent sources have confirmed that the city and Metro have come to agreement on an expanded restructure of Metro bus service in SE Seattle for the September service change. 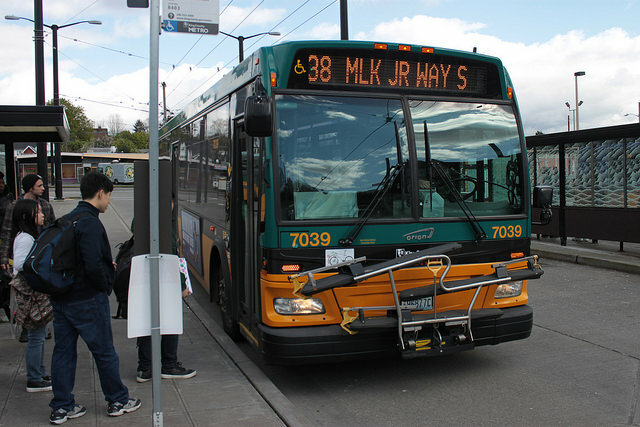 The city had balked at partially funding the initial restructure on policy grounds, with disagreements largely centering on the merits of extending MLK bus service to the International District via Rainier/Jackson. Unable to fund the larger restructure on its own, Metro came back with a scaled back version that seemed to please no one, cutting Route 9 to fund a weekday-only Route 38 extension while leaving the remaining network untouched. The new compromise has not been published yet, but our sources say the city will fund additional Route 124 trips and will acquiesce on the IDS extension. There seems to be a mutual understanding that the 106 extension would be a temporary (but indefinite) measure, waiting until things like interagency fare policies align and transfer hubs like Mt Baker improve, which unfortunately may be 4-5 years away. Longer term, an MLK-Downtown route may (rightfully) endure if Routes 48 and 7 are consolidated as laid out in Metro’s new Draft Long Range Plan. Though our objections to sending the 106 downtown remain – we worry about reliability on Jackson and Rainier and would prefer better overall frequency on MLK – the rest of the restructure would do lot of good work providing new connections between Renton, Skyway, Rainier Beach, South Beacon Hill, and Link. We’ve been moving towards a frequent transfer network in Seattle, with the ULink restructure as the most prominent example of that, and reinstating a mostly redundant service is disappointing. The same riders the new 106 is intended to benefit will suffer on evenings and weekends when the extension forces their frequency down to 30 minutes. But no restructure is perfect, and the proposed changed are likely a net win for riders in SE Seattle. So Saturday daytime frequency suffers between Mt. Baker Stn. And Rainier Beach? Currently every 15 minutes now? According to Metro, frequency would be unchanged from the current 38. So what exactly is the problem that necessitates this restructure? It’s odd that the 38-Rainier regression is prioritized above Metro’s proactive restructures and contradicts the draft long-range plan. Metro has failed to articulate why this is so beneficial, and why it’s so urgent it must be done now. This is in contrast to; e.g., the northeast Seattle restructure or the RapidRide C restructure where Metro pointed to new connections to Link trains, crosstown grid service, frequency in the highest-volume West Seattle corridors, etc. The only reason we’ve been able to think of is the county council must be pressuring Metro to reinstate a MLK-Rainier route to connect two ACRS facilities who complained loudly about losing the 42 (even though their clients rarely used it). Maybe the new route should have gold-plated buses to show that this is the highest priority in Seattle. However, advocates who want to keep route 2 on Union St and 6th Ave W, route 4 on 23rd Ave S, and route 12 on 19th Ave E will want to know why they shouldn’t get the same pre-emptive priority that MLK-Rainier advocates are getting. Any more details on the 107’s new routing? I like the idea of better Georgetown connectivity, and I feel like a Link transfer at Beacon Hill is a good solution to that. The 60 sort of provides that, but it’s not frequent enough and it misses a lot of Georgetown. As far as I know, it will look something like this from Rainier Beach to Beacon Hill. South of Rainier Beach it will remain unchanged. Hmm, OK. I’d like to see it routed up Corson or Airport Way to Lucile and back to 15th for better coverage. Will the out-and-back really just jump out across Albro and U turn back across it, or was that just a simplification to illustrate the general idea? Airport. Keep Corson out of this, as that is blocked by the stub track. But thanks for the great idea! See also https://metrofutureblog.wordpress.com/2016/04/27/update-revised-southeast-seattle-bus-service-proposal-heading-to-county-council/ as posted by Evan above. Great news for The Museum of Flight – Route 124 could use more frequency! the 124 is rhrough-routed with the 24? I was under the impression that the transfer situation on route 38, at least path-wise, is pretty close to Eudomonaia, at least since the March restructure. Every northbound rider on route 38 south of Columbia City Station just has to cross the northbound half of MLK to access a station. (Those transferring at Rainier Beach Station can stay on until Othello Station to avoid having two crossings.) Those boarding the 38 north of Columbia City Station have a stop at the east entrance to Mt Baker Station, right after pulling through Mt Baker TC. Southbound, riders from Mt Baker Station board the southbound 38 at the east exit from the station. Riders transferring at other stations cross the westbound half of MLK to get between the station and a 38 stop.. This is as good as it gets. The 38 extension to IDS, in addition to re-introducing a reliability killer, takes away the perfect transfer for riders living between Columbia City Station and Mt Baker Station. And of course, that transfer would be even better if it were as frequent as Link, but, once again, infrequent riders and non-riders are looking at a map rather than timing trips. Furthermore, if the extension is just there until Metro “solves” the financial issues that incentivize cash fumbling and hoarding of non-expiring paper transfers, this will add to the constituency that wants to keep paper transfers. The City, for its part, should insist on a deadline for eliminating paper transfers, or it really isn’t getting anything out of this “deal”. If there are still riders avoiding Link a year from now because of transfer financial penalties, they have a frequent transfer situation at Mt Baker TC (38 to 7 northbound) and at Mt Baker Station (7 to 38 southbound). So, let me ask a stupid question: Why can’t the rest of the restructure happen without the IDS extension, and why can’t that IDS extension money be used instead to increase frequency on route 38/106? Because the IDS extension is what’s driving this. Without it the other restructures would probably just remain on the back burner until something else kicks them (perhaps the 2023 Des Moines restructure). But now that the other elements are on the table, and getting verbal support from county councilmembers, what is to stop the rest from going forward without the IDS extension? Are there councilmembers championing other parts of the restructure? That would be a good sign. Lest I sound unappreciative, I do appreciate the City’s funding of more frequency on route 124 (and note it could do that without agreeing to the IDS extension it doesn’t really want), and very much want the 106-south through-routed with the 38. I also very much appreciate the new route 107-north, and hope all this happens regardless of the IDS extension. This actually improves the safety of the northbound school bus stop, as riders could be let off right in front of the school. Southbound would involve crossing Lucille, which is a fair trade-off so no students ever have to cross 15th Ave S again at the school. This may even be faster than a straight shot up 15th Ave S during the times when it becomes a barely-moving loading zone right before first bell and after final bell. Just be sure to ban private loading and unloading on Lucille during these hours, and force those drops to be in the portion of 15th with no buses. This path avoids the dreaded stub track on Corson just west of Airport, but still gives 107 riders a reasonably short hike to the South Seattle Community College Georgetown campus. But I would still encourage Metro to hold a well-advertised public meeting at Cleveland High, so that those who will assumedly benefit and know the traffic patterns better can chime in en masse. It may as well be held before the path is decided, since a meeting will have to happen there eventually to educate stakeholders about the new path. I totally agree with the Georgetown proposal. I asked about it a few comments up, in fact. It covers Georgetown a lot more completely than the single stub off Albro too. In addition to the path issue, it is crucial that Metro plan for adequate spike frequency before first bell and after last bell. The beneficiaries of the frequency spike should outnumber the riders south of Albro who lament losing their one-seat ride downtown. This is interesting. Appreciate you noting it would require require outreach to those of us on the Gtown side of the proposal. The AM peak may suffer as NB Airport Way backs up frequently in the Georgetown area. 15th Ave S can get pretty paralyzed by school traffic, too. I’m not sure which is worse. I sometimes think that the objective is to keep introducing changes in a single, successive alternative until we get tired of commenting on them and simply have the staff implement that latest one. Rather than put lots of chairs (alternatives) out there and compare and contrast until we get the best one, we get a game like musical chairs where we walk by chairs (alternatives) one at a time until the music stops and we have to take the one nearest to us. Maybe we should replace the planning department with a HAL 9000. This is not like other restructures where major new service caused a realignment of the grid. Rather, it is from tone-deafness by a committed group to the concept of a grid and extreme transfer-phobia. The transfer between routes 7 and 38 is about as good as a transfer gets. No street crossings are required, and both are reasonably frequent. There are few transfers in town where riders are so lucky. If more frequency were added to the 38, the two routes could even have timed transfers. The transfer between route 38 and Link is also about as good as a transfer gets. There are some ORCA-phobia issues at play, related to Link, but the 38/7 transfer takes care of that, if one is not absolutely opposed to multi-bus rides. The 38 ID extension is an expensive solution in search of a problem. Thank you, SDOT, for salvaging an overall improvement to the bus network. You are a bulwark against the depredations of Dow’s political hacks, ACRS, Transportation “Choices” Coalition (who are stunningly bad at actually making choices), and King Country Metro’s spineless management. For the record, TCC opposed the previous version of the legislation, characterizing it as “an incomplete solution”. Bruce, we opposed the original restructure and worked with SDOT and Metro on this proposal. We can agree to disagree without being disagreeable. Happy to have an offline discussion on this. Metro has been promising to add a BRT for RAS as a replacement for the sorely missed 7x. Now that the 9 will only run during peak, will the BRT route be moved up? The Route 7 has very high ridership yet has become this decade’s slow boat to hell: stopping every couple of blocks, stuck in traffic, not synced with light rail and primary transport to FHS. The previous version of the proposed restructure had route 106 using the same stops as the current 9x between Mt Baker Station and S Jackson St. The whole route 7 is slated for eventually becoming RapidRide, but split at Mt Baker TC, with route 48 being joined with the southern portion, as Frank reported. RapidRide-ization generally comes with stop consolidations, but there is no particular reason to wait until then to do some stop consolidations, if riders ask for it and are willing to go along with it. For the bulk of riders riding during peak, timing the transfer would require running the 7 as frequently as Link, which is not currently the case. That would be a worthy investment of the money being taken from 9x off-peak, but it would require capital investment for more buses. Regardless, route 106 is not proposed to run at the same frequency as the 7, so no timed transfer is in the works. But there is still time to convince the council to invest in timed transfers rather than non-intertimed duplication that will only worsen the bus bunching. Thanks Brent. My primary concern is RAS south of Mt Baker. Timing transfers at the Mt Baker Station for the 7 would be helpful but definitely not a final solution. I just can’t get my mind around removing the 7x and off peak 9x with nothing invested on the route with all the savings. “Eventually” becoming Rapid Ride cannot come soon enough, which, believe me, I’ve shared with Metro at every opportunity. Side note re 9x, not really a positive to require SE residents to take two buses to the trolley in order to get to Swedish as a replacement to the 9x off peak.